“AGS [Adventure Game Studio] is easy,” says Dave Gilbert, when I ask if he’s started to run up against the limitations of the now 20-year-old engine for adventure games. I’ve met up with Gilbert to discuss his latest game, Unavowed—the first Wadjet Eye title he’s spearheaded since 2014’s Blackwell Epiphany—and not long after we start talking I’m reminded that Gilbert continues to be AGS’s best advocate. It’s not just that Wadjet Eye is the primary publisher of AGS games nowadays (including critical darlings Gemini Rue and Technobabylon). It’s that Gilbert continues to do things with AGS that I didn’t think were possible—and then he says it’s easy. Maybe it is, for him, but I can’t help but think if it were actually easy we’d see more quality AGS titles. 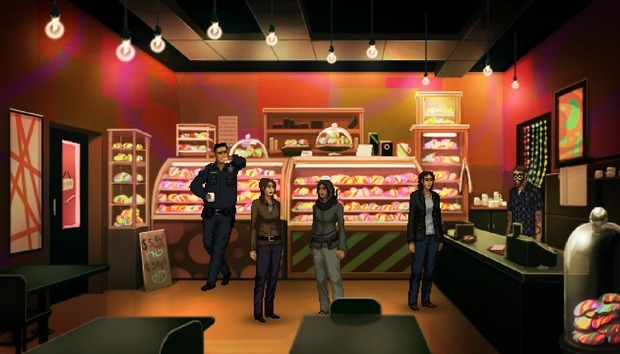 With Unavowed, Gilbert’s pushed even further, managing to blend a point-and-click adventure with elements of BioWare-style RPGs—character creation, companions, and even the non-linear story structure. Okay, character creation’s not quite as in-depth as a BioWare RPG. You won’t be sculpting your little pixel-art face or anything. Unavowed begins with an exorcism. Your exorcism. You’re standing on a rooftop, lightning coursing through your body but still slave to a demon’s will, and you’re compelled to remember your past—bartender, actor, or police officer. It’s not an idle choice. Your career choice sets up the next scene, a short prologue backstory that, yes, is different for each of the three professions, though Gilbert says each comes to a similarly-grisly end. For my demo we choose a police officer, responding to a murder scene and then...well, best not to spoil it maybe. Suffice it to say, it’s “just like a Bruce Lee film.” The game’s words, not mine. Three different stories though and then you’re back on the rooftop, lightning channeling through your body again as you struggle to get rid of the demon that’s possessed you. It’s the setup for a tale of redemption that spans every borough of New York City. Set in the same gritty-supernatural universe as the Blackwell games, you join a group known as the Unavowed dedicated to fighting evil. And you make some friends along the way. Gilbert takes me through a few examples. At one point we’re on a speedboat, being chased by a demon down what’s presumably the Hudson River. One of our companions, Eli, is a fire mage. With Eli in our group we found a spare can of gasoline hidden away in the speedboat, threw it on the demon, and then lit it on fire. But replace Eli with Madonna, a more athletic companion, and the scenario changes. This time around we simply slow the boat and Madonna leaps on the demon with her sword. Other characters even react differently, depending on who’s in your party. Vicki, our fellow police officer from the prologue, is a potential companion. Since she’s part of the force, other officers will be more forthcoming with information. Don’t have Vicki in your party for that mission? The police will be standoffish, and you’ll have to get the info a different way, like using Logan’s ability to speak to ghosts. This stuff’s not exactly revolutionary for “Video Games” as a medium. Multiple paths to an objective? Characters reacting to your party members? Yeah, okay. Been there, done that. But there’s something weirdly thrilling about seeing it folded into a traditional point-and-click adventure game, a genre that’s, at least mechanically, barely evolved since the ‘90s. “Basically I’m designing each mission five times. I really want each path to be unique, and I want that feeling of ‘What if I went back and tried a different combination?’” says Gilbert. I’d also like to note that Unavowed is beautiful. It still has that mid-90s point-and-click look, but Wadjet Eye’s longtime artist Ben Chandler has really outdone himself here. The resolution’s been upped from previous games, and the result is some of the smoothest pixel art I’ve seen in an adventure game—not the “Flash” look used in many of Daedalic’s games, but something in between. It solidifies Gilbert’s vision of New York as this mystical place where the supernatural hides in the shadows. We walked around Staten Island a bit during the demo, and the leap in fidelity over Blackwell and even last year’s Shardlight is noticeable. And he did it in AGS. “I stick with the devil I know,” says Gilbert, laughing. “If I had the budget I wouldn’t use pixel art, I’d love to have real-time 3D or whatever like Life is Strange or what Telltale does. As I said: Dave Gilbert, AGS’s finest advocate. Unavowed is set to release later this year, so keep an eye out.